I have been intrigued with cooking with cola and other soft drinks ever since I first read about it – which was in the Nigella Lawson’s book “Nigella Bites”. Leave it to me to learn about Southern cooking from a British food writer. I started to experiment with barbecue sauce and the result is this jazzed up version for brisket. It’s a great way to entertain a crowd with big flavor and little work. The sweetness of the cola permeates the brisket which is then perfectly balanced with the acid coming from both the Balsamic vinegar and Worcestershire sauce. You will find yourself making dish over and over again. Yes, it’s that good! Place brisket overnight in a sealed plastic bag along with the barbecue sauce. Next day, preheat oven to 275F. Empty the contents of the plastic bag into a Dutch oven include all the sauce. Cover with lid and place in the oven for approximately 4 hours. Brisket takes approximately 1 hours and 15 minutes per lb to cook. Remove from oven. Using two forks pull the meat apart and shred into the remaining sauce. Combine and serve. This can also be served as a sandwich using either fresh rolls and coleslaw or as a soft taco along with some sour cream. In a medium saucepan bring all ingredients to a boil, then reduce heat and simmer for 30 to 45 minutes , sauce will thicken . Cool and use with steak, chicken or pork. 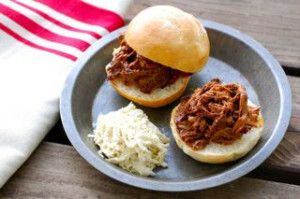 Note: no diet cola for this – the sugar is essential to the taste of the barbecue sauce. This entry was posted in beef, main dish and tagged beef recipes, brisket recipes, cola recipes, family dinners, Nigella Lawson, summer food, summer recipes on May 24, 2014 by entertainingbythebay.